Oh no! Your computer has had an accident - maybe you spilled some water on it, maybe you got a nasty virus, or maybe one day it just decided not to wake up and nothing you can do will fix it. On your new computer, go to your Online Portal and download the software. Choose your destination folders and let the software download all of your files onto your new computer - good as new! 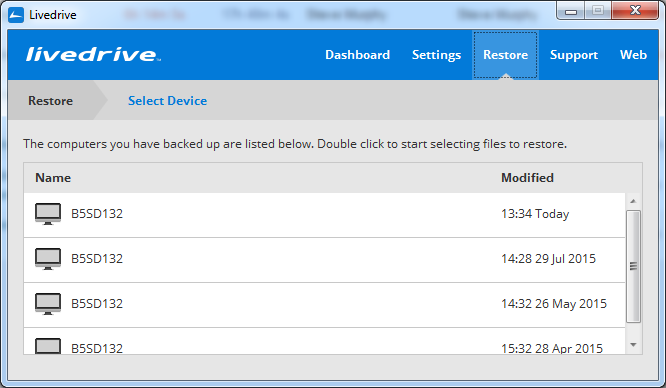 The Restore function allows the user to select which files they would like to restore. The user will be directed to the select device screen that lists all the different devices that have been backed up on the cloud with the most recent at the top. By double-clicking on a device they can view the files and folders that have been backed up from this device. When restoring data, the user will be presented with several different options dependent on the file, folder and device they are using. If the user chooses to restore a folder where the original location exists on their system they will be presented with the option of either restoring this to the original folder location or choosing a new folder to restore to. 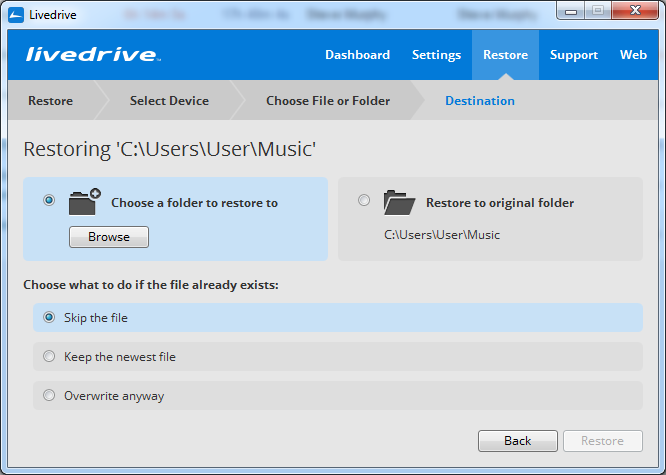 If the file to be restored already exists the user can choose to skip the file, keep the newest file or overwrite the existing file on their system. If the original location does not exist you will only have the option to choose a new folder to restore to. Upon completion of a restoration process you will be provided with information on the status of the restoration and the option to view a restore report. If there were any issues with the restore process you are presented with the option of restarting the restore process or going back to the beginning of the restore process. If you choose to restore a file that has previously been backed up, you will be presented with the option to restore previous iterations of this to either the original folder or an alternative one. If there are no previous versions of this file you will only be presented with the option of restoring the single version that is backed up. 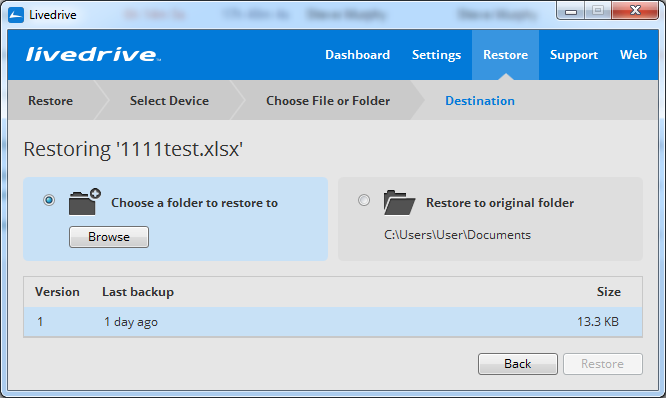 If the same file exists in the destination folder for the restore you are presented with the option to overwrite the existing file. The restore report allows you to view a list of the files that have been restored on their default web browser. If you have trouble with this step, don't hesitate to contact us!